Vancouver, British Columbia, Canada - Anarchists claimed responsibility for smashing a number of windows at a branch office of the Royal Bank of Canada in protest of their sponsorship of the 2010 Winter Olympic games which are scheduled to be held in Vancouver. In a statement released via the internet the anonymous protesters claimed their action is only "a tiny taste of the mayhem we [would] like to see submerge the city of Vancouver for 2010." In October, an intercontinental coalition of indigenous have called for a boycott of the games because they are destructive to the environment and are to be held on "stolen land." 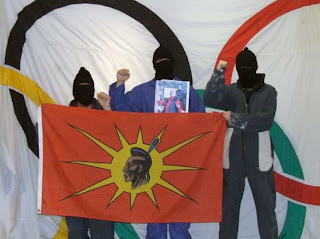 Last March, Native Warriors stole the official Olympic flag from it's perch above downtown Vancover in protest. That action was dedicated to elder Harriet Nahanee who died following her imprisonment for protesting the expansion of the Sea to Sky highway – the primary artery to the main site of the 2010 winter Games.